Did you notice an explosion of June Bug beetles this summer? 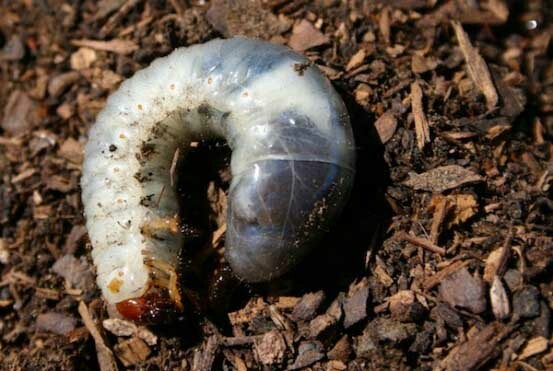 Now is the time their larvae is doing the most damage in your landscape. In their larval stage, they are know as grubs. They typically feed on organic matter in the soil, but will move on to plant roots when organic matter is low and their population is high. You’ll most often find them in ornamental landscape beds and around your foundation plantings where soil contains more organic matter. If you keep the soil in your lawn areas healthy, you can reduce their damage. This is what you should look out for as you dig around the soil in your lawn and landscape. We don’t usually treat for grubs unless there is an infestation and your lawn areas are being damaged. If we do find that your lawn requires treatment for grubs, we can do so without chemicals. Instead, we we treat organically with nematodes that are in our worm castings provided by Texas Worm Ranch. This is a proactive approach of supplying beneficial predatory nematodes to control harmful root feeding grubs year round. By increasing the organic matter in the soil, we give the grubs something else to munch on besides your plants!